Molecular Physiology & Biophysics Graduate Program | Berger/Stumpff Grad students win team speed walking division of the Vermont Corporate Cup! 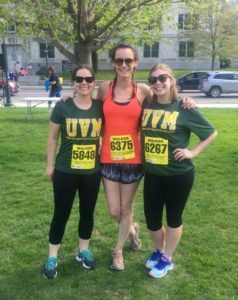 Alex Thompson, Leslie Sepaniac, and Dominique Lessard walked away with a repeat victory in the team (named: “2 Kinesins 1 Dynein”) speed walking division of the 2018 Vermont Corporate Cup, held May 17. Congrats Alex, Leslie and Dom !